Tournaments designed to showcase and provide a method of safe competition to improve and grow martial arts skills sets. 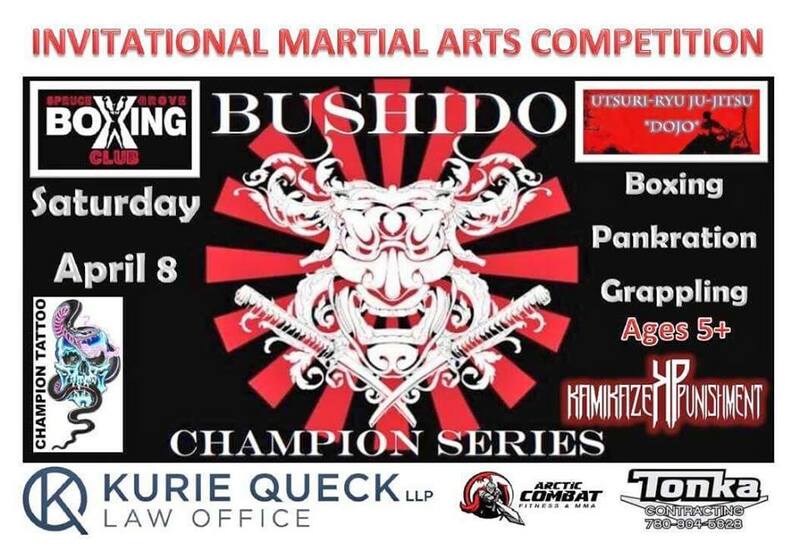 Event proudly sponsored by Kurie Queck LLP Law Office providing access to this event completely free for all athletes & competitors not matter their affiliation helping to properly growing the combat sports. Bushido champion series is dedicated to hosting various forms of martial arts in safe and enjoyable tournament formats for all skill levels to test themselves. It is intended to show support, visibility, and appreciation to the competitors. We have now added boxing, kickboxing and no gi grappling to this event as well as the children's martial arts tourney in the morning. We are conveniently located in North East Edmonton and we serve the entire Greater Edmonton Area.